Welcome to issue 44 of our quarterly retro magazine. Here's a taster of what's inside . . .
ROMAN CHYLA looks back at the history-making exploits of his fellow countryman Mike Polukard, who literally sacrificed his life trying to help others achieve the stardom he earned at Bydgoszcz and for Poland on the international front. ROB PEASLEY looks back at the early years of Oxford Cheetahs, when the likes of Pat Clarke, Ronnie Genz, Arne Pander and Ron How were the Kings of Cowley and the National League championship came to Sandy Lane. Nowadays most promoters have a main business outside the sport and treat their club as a glorified hobby. But it wasn’t always like that. Right up to the 90s, speedway was often the promoters’ only source of income. DOUG NICOLSON looks at the life and times of Danny Taylor, who, although he passed away 50 years ago, is still fondly remembered at Glasgow and Berwick. PHIL CHARD talks to unsung rider Peter Lloyd, who had spells riding trials, grasstracks and even car racing as well as a multitude of speedway clubs, including Middlesbrough, Newcastle and Poole. VITEK FORMANEK catches up with Stanislav Kubíček, one of the most outstanding Czech riders of his generation. He starred for the 1963 World Team Cup Final silver medalists who finished ahead of Great Britain in Vienna. In our new series, TONY McDONALD raids Retro Speedway's vast archives and looks back at publications and what they were writing about. First up we've got extracts from 1953 and 1958 editions of Speedway World and one from a 1965 Speedway Pictorial. Poignant family pictures from the a private ceremony in Woolston Cemetery, where Ivan Mauger's ashes were interned at his spiritual home in Christchurch, New Zealand. Chris Martin, a Weymouth rider in the early 80s, recalls the honour of riding Ronnie Moore's old Wall of Death fairground attraction in their native New Zealand. Plus . 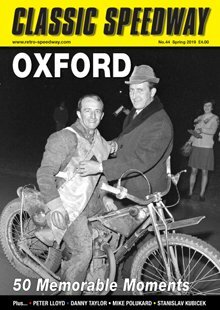 . . pictures from the annual Celebration of Speedway event, obits on Don Cuppleditch, Miroslav Verner and Jim Purdey, crossword, your letters and a full-page team photo of the 1969 Reading Racers.